Do you use paper towels to clean up every day messes? Want to cut down to save money and resources? The U.S. Environmental Protection Agency reports that paper accounts for the largest share of household waste. In 2006, 34% of our trash was paper. Paper towels are one source of paper waste, and most can’t be recycled once used. Their production uses resources, from plant fiber to petroleum in the production process. Some paper towels are bleached, which adds dioxins to our environment. There are more environmentally friendly alternatives, such as recycled, non-bleached paper towels, but why not try to ditch or dramatically reduce their use altogether? Wiping counters, tables, high chairs: Use dish towels, rags, old clothes or sheets, cloth diapers, or burp cloths. Don’t have enough dishtowels? Look for them at thrift stores. Cleaning windows: Switch to newspaper and you’ll love how streak-free you can get you windows. Napkins: Switch to cloth napkins, which you can get cheaply at Ikea (49 cents) or make yourself. Soaking up grease when frying: Try newspaper or scratch paper (save from school notices, outdated stationery from an office). If newspaper cones work as french fry holders for the French and Belgians, why not us? Do you have other alternatives to paper towels to share? Tell your story – create a thankful book! by ·Comments Off on Tell your story – create a thankful book! This time of year, as things get hectic and there are toys and temptations at every corner it’s a great time to slow down and focus on the many blessings in our lives. 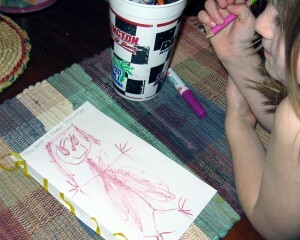 Having conversations with our children about what they are thankful for can be heartwarming and at times even comical. Creating a book to detail these stories is easy, and makes a wonderful keepsake or gift for a loved one. 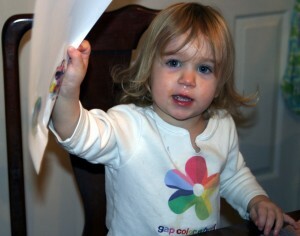 Even the youngest of children can help with this project, which makes it even more special. Take blank scrap papers and fold each of them in half. 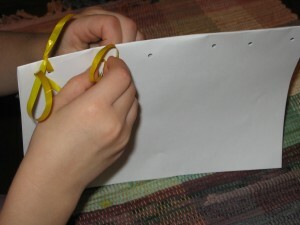 Using a hole punch, make several evenly spaced holes just inside the folded edge. 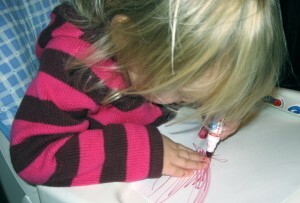 Thread the paper together using string, yarn, ribbon or whatever you have on hand. 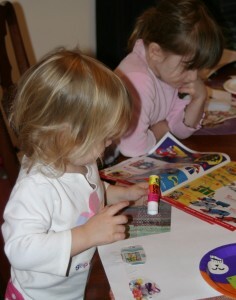 Crease each of the pages open to form a fold and have your child decorate each page. 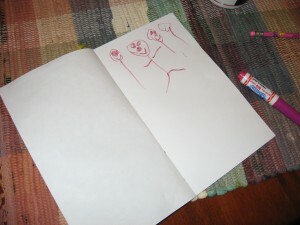 If they are old enough to write, they can write a note or tell a story. If not, you can ask questions and fill in the story for them. Just don’t forget to make one to keep for yourself! Black Friday? Make it a Green Friday. by ·Comments Off on Black Friday? Make it a Green Friday. Planning to hit the Black Friday sales this week? Why not change the color and the impact, and make it a Green Friday instead? Make donations to honor someone. Consider making a donation in a loved one’s name. Here are some organizations we love and support. Give time or skill, not stuff. How about a gift of date-night babysitting, a home cooked meal, lawn mowing, or laundry for a month? Or if you have a special skill like gardening, massage, scrap-booking, video editing, or musical skill, how about giving a gift of one of those talents? Who doesn’t want their family pictures finally organized? Buy gently used. Wonderful and less-expensive presents are easy to find in consignment stores, used bookstores, online, and even in thrift stores, and you’ll give an item a second life instead of a ticket to the landfill. If you’re looking online, Craigslist, Freecycle, and eBay are good places to start. Upcycle. If you’re handy, buy presents at thrift stores and spruce them up a little. See this site for some creative inspiration and guides to upcycling just about anything you can think of! Buy sustainably-made products. Look for products made with recycled or renewable materials. Steer clear as much as you can of plastics, and instead go for gifts made from natural, organic materials. Another way to reduce impact is to buy items that will last, and can be handed down to others in good shape. When buying for kids, check out Healthy Stuff to make sure that your gifts are free of toxic chemicals. 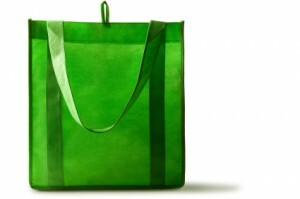 When you go shopping, remember your reusable bags, take public transportation if you can, and have fun! Tis the season for toy catalogs and commercials galore – here is an idea to help your kids avoid the “gotta have it all” attitude and reuse some of toy books at the same time! Rather than resisting the catalogs, allow your child to look through the pages and think about what they really might like. Ask them what toys their siblings, friends and family might like. This can lead to some great conversations! Then, depending on your child’s age, either allow them to cut out the toys they are most interested in receiving, or have an adult provide some assistance. 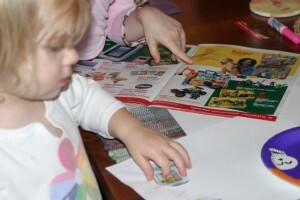 Once the pile of toy pictures is complete, recycle the remaining catalog and begin the process of “editing”. Decide on an acceptable size for child’s wish list/letter to Santa. Explain that if all the toys that were cut from the catalog don’t fit, then choices need to be made. 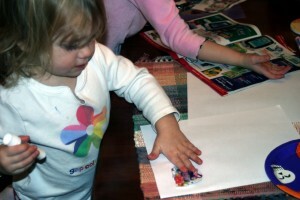 This allows your child to really think about what he wants and get creative arranging the pictures into a collage. When the list is complete, if a new picture comes along it needs to be pasted on top of an existing picture. 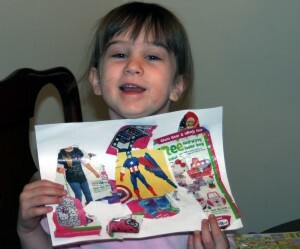 A Santa collage allows younger kids who wouldn’t be able to read a written letter to Santa to see what they have chosen for their list. Do you write letters to Santa with your kids? Podcast: Read to your baby! by ·Comments Off on Podcast: Read to your baby! 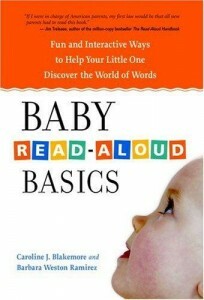 We’re so pleased to share a podcast interview with Caroline Blakemore, co-author of Baby Read-Aloud Basics. Tanya spoke with Caroline about the many reasons to read to babies, tips for reading to babies, how reading aloud changes from the newborn to toddler period, and more. Caroline shared why, as a reading specialist for older kids, she became such an advocate for reading to babies, as well as her opinions of programs that claim to teach babies how to read. You can listen to the podcast using the player below, listen with Quicktime, or download it at our free iTunes store! The Cornell Lab of Ornithology (the science of birds) wants help tracking winter birds in North America. You and your kids can join Project Feeder Watch and become citizen scientists! All you have to do is order a kit, put up a feeder, count the birds who visit it, and report your observations to the project. They do request a $15 donation to offset the cost of the kit, which includes a bird identification poster, instructions, and a newsletter. And your kids’ observations are used for real world purposes. For example, data from this project, which showed a steady decline in the population of Painted Buntings in Florida. This information helped lead the Florida Game and Fresh Water Fish Commission to begin systematic monitoring of this species to see how they could be protected. And the Cornell Lab wants you to have a free 2012 “Bird-Watching Days” calendar, (while supplies last) whether or not you participate! Thinking about year-end giving? We hope you’ll consider donating to organizations we support. by ·Comments Off on Thinking about year-end giving? We hope you’ll consider donating to organizations we support. If you’re thinking about year-end charitable giving this week, we hope you’ll consider donating to some wonderful organizations we support. 1% for the Planet. 1% for the Planet is helping to tilt the scales of giving toward the thousands of under-funded nonprofits dedicated to the pursuit of sustainability, to preserving and restoring our natural environment. We are proud members of 1% for the Planet. As a member, we are contributing one percent of revenues directly to some of the approved non-profit environmental organizations in the 1%’s network. Over 1,600 non-profits worldwide are included in the 1% program. Ocean Conservancy. One of the organizations we are supporting through 1% for the Planet is the Ocean Conservancy. The Ocean Conservancy promotes healthy and diverse ocean ecosystems and opposes practices that threaten ocean life and human life. Through research, education, and science-based advocacy, Ocean Conservancy informs, inspires, and empowers people to speak and act on behalf of the ocean. In all its work, Ocean Conservancy strives to be the world’s foremost advocate for the ocean. Nature Conservancy. One of the organizations we support through 1% for the Planet is the Nature Conservancy. The mission of The Nature Conservancy is to preserve the plants, animals and natural communities that represent the diversity of life on Earth by protecting the lands and waters they need to survive. The Nature Conservancy uses a science-based approach aided by more than 700 staff scientists. Furthermore, The Nature Conservancy pursues non-confrontational, prgamatic solutions to conservation challenges and partners with indigenous communities, businesses, governments, multilateral institutions, and other non-profits. Feeding America. As the nation’s leading domestic hunger-relief charity, Feeding America provides food to more than 37 million people facing hunger in the United States. Food is distributed to individuals and families in need through a network of more than 200 food banks in all 50 states, the District of Columbia, and Puerto Rico, which distributes more than 2.5 billion pounds of food and grocery products annually. Member food banks support approximately 61,000 local charitable agencies and 70,000 programs which provide food directly to people in need. Carbon Fund. Carbon Fund is the leading nonprofit carbon reduction and climate solutions organization, making it easy and affordable for individuals, businesses and organizations to reduce their climate impact by supporting third-party validated renewable energy, energy efficiency and reforestation projects. Carbonfund.org has over 450,000 individual supporters and works with over 1,400 business and nonprofit partners. By becoming a partner in Carbonfund.org’s CarbonFree® Partner program, Dandelion has joined a national movement of businesses and organizations that are leading the fight against global warming. Programs like the Million Tree Challenge are great opportunities to be a part of this large global movement.